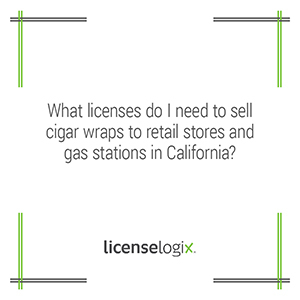 What CA business licenses do I need to sell cigar wraps? In accordance with California Cigarette and Tobacco Products Licensing Act of 2003, every distributor and every wholesaler is required to have a license that is renewed annually. The license is offered by the Board of Equalization (BOE). You could be required to obtain additional Permits and licensing requirements depending on your exact business operations. Maintaining complete purchase records for four years, including all invoices and receipts on file for one year. Allowing the BOE to review your sales and purchase records. Recording the amount of excise tax paid to the BOE. Maintaining an Itemized list of all products sold. Providing a statement that identifies any cigarettes or tobacco products sold without tax. Inspection by BOE staff and law enforcement agency employees possible seizure of any undocumented cigarettes or tobacco products, including cigarettes without tax stamps or with counterfeit tax stamps. Failure to maintain accurate and complete records and include the required information on invoices is a misdemeanor punishable by a fine not to exceed five thousand dollars ($5,000), or imprisonment not to exceed one year in a county jail, or both fine and imprisonment. As a distributor or wholesaler, you have a duty to only purchase cigarettes from a manufacturer or person who is licensed. Also, you may not sell cigarettes or tobacco products to a distributor, wholesaler, retailer, or any other person who is not licensed with the BOE, or whose license has been suspended or revoked. To avoid possible fines and imprisonment from non-compliance the experts at LicenseLogix can provide you with detailed research tailored to your particular needs to make sure you are compliant with all laws in each jurisdiction you want to sell your products. It is important to note that you might also be required to hold licenses on the county or city level as well. Our license research service will provide you with a comprehensive packet disclosing all the licenses and applications you will need. Should you not want to deal with the hassle of completing all of the applications, LicenseLogix can complete the applications and file them for you. After your applications have been processed our team will be with you the entire process until you are licensed. We also offer CliC, a license compliance tool providing an easy way to organize and stay ahead of your license renewals. For more information on how we can streamline the process of business licensing you can contact us by clicking our live chat function, submitting a question to our licensing team or simply call us at (800) 292-0909.